Embroiled sportswear rivals Adidas and Nike are struggling with perception and potential revenue in ways they haven’t in a long time, according to YouGov BrandIndex. While it is coincidence that both brands should find themselves in hot water at the same time, each is taking a different tack to handling their crises, and it remains to be seen how long the damage will last. Pressured to drop Kanye West’s Yeezy line in the wake of the rapper’s controversial comments and tweets about slavery and Donald Trump, Adidas has seen both its consumer perception and potential revenue metrics drop over the first half of May. While Adidas hasn’t commented on the controversy, and its CEO dodged questions in a Bloomberg interview, the brand’s consumer perception levels are currently at their lowest point in a year. Consumers seems to be reacting with their wallets too: at the end of April, 28% of adults 18 and over said they’d consider buying Adidas the next time they were shopping for clothing or shoes. Currently, the percentage is 23%, also a one-year low. While Adidas may not terminate West’s contract, silence and denial have not always proven to be a sound perception strategy. Recent YouGov data showed that despite an exodus of executives stemming from toxic workplace accusations, Nike’s consumer perception managed to hold up. More executives have since departed, seeming to cause perception to decline once more, but again, not on the scale of a major crisis compared to previous years. Nike actually spent most of 2017 hovering at lower perception levels. As opposed to Adidas, Nike’s CEO has been vocally at the forefront of the situation, acting contrite and promising better results. However, Nike’s Purchase Consideration is taking a more serious beating. 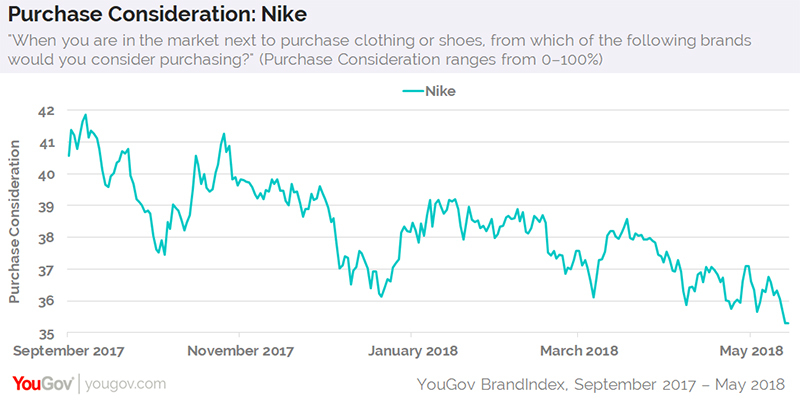 Currently, 35% of consumers would consider buying Nike the next time they were shopping for clothing or shoes, its lowest level in 11 months. It is notable is that men have been pushing down Nike’s Purchase Consideration levels further than women.